Have you attended or watched 500 Startups‘ latest Demo Day? If you have, you probably noticed that this new batch of accelerated startups is even more international than the previous one. It’s the first time Brazil has been represented, as Conta Azul and Rota dos Concursos are respectively from Joinville and Brasilia. This is not an accident, but the result of a strategy Dave McClure announced during Geeks On a Plane‘s first trip to South America last year. 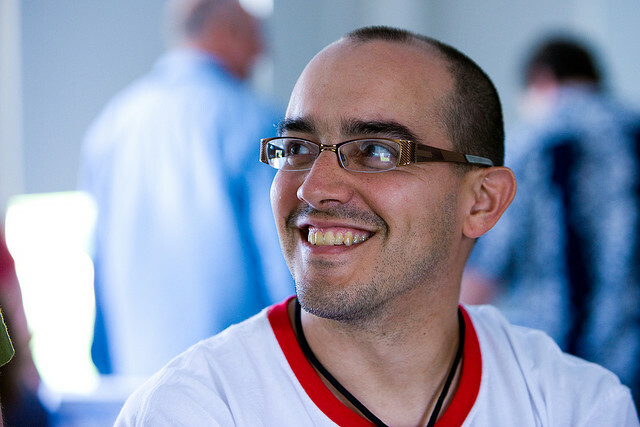 At the time, McClure made public that he had invested in the Chilean event management startup Welcu, founded by Webprendedor’s organizer Nico Orellana. Welcu then moved to Silicon Valley to participate in 500 Startups’ second acceleration program alongside another Latin American company, the Mexican job interview platform Ovia. While these two startups came from Spanish-speaking countries, 500 Startups is also very well connected to Brazil, in the person of Bedy Yang (see our previous post). Besides managing her own venture, Brazil Innovators, Bedy is also one of 500 Startups’ staff members – and Dave McClure’s eye in Latin America. As such, she was instrumental in bringing ContaAzul and Rota dos Concursos to Silicon Valley. ContaAzul is actually a spin-off of Roveda’s previous IT company, Informant. Interested in innovation, he attended several events that Bedy co-organized over the last couple years in Brazil, from BR New Tech and Geeks On a Plane’s stopover in Sao Paulo to Startup Weekends. When she started scouting Brazilian startups for 500 Startups’ accelerator, she recommended ContaAzul to McClure, and the company was selected. Since it moved to Silicon Valley at the end of August, ContaAzul’s customer acquisition went very well, Roveda says – not only for free trials, but also for paid subscriptions. The team is already flying back to Brazil in a couple weeks, but it certainly hasn’t any regrets. “We learned constantly while at 500 Startups, from interacting with the team and mentors, but also from other participating startups” Roveda explains. “We had read a lot about startups and best practices in Brazil, but it was fascinating to see the principles at work. The other teams were following these rules very automatically – it was a completely integrated and natural process. The other Brazilian startup in 500 Startups’ third batch is called Rota dos Concursos, which roughly translates to “Road to public examinations.” This is a very popular subject in Brazil, where most of the public servants are recruited through public contests. Aptly based in the country’s administrative capital, Brasilia, Rota dos Concursos provides online test prep, but there’s much more to its story than finding a buoyant market. The family of its co-founder Helio Silva doesn’t come from Brasilia, nor from the elite. His mom was born in one of Rio de Janeiro’s slums (favelas), but she managed to study and work for the Brazilian administration in Brasilia. Without education, Silva explains, he wouldn’t be where he is right now – himself studied at Brasilia’s well known federal university, where he met his co-founders. It’s a good thing for his startup that Silva likes to read and learn; otherwise, he may have accepted the first small angel investment he was offered, in exchange for a majority equity share in the company. Silva knew it was wrong from articles he had read, and this was also by reading a magazine that he found out about Bedy Yang and Brazil Innovators. Silva also has this boldness that often characterizes good entrepreneurs: after stumbling upon his first meetup on entrepreneurship in Sao Paulo and hearing of the successful Brazilian entrepreneur Marco Gomes, he decided to attend TC Disrupt – and booked his flights without a ticket for the event. Silva was sure he would figure it out once in Silicon Valley, and he did when he finally obtained a ticket during the hackathon that precedes the conference. When he finally managed to meet Bedy and tell her about his ambition to improve education in Brazil, she decided to make the necessary introductions for Rota dos Concursos to join 500 Startups. Over that period, the company’s user base grew very fast, from 4,000 to 13,000, Silva says. That’s not all: during its time in Silicon Valley, the team also made invaluable connections and learned a lot on what drive successful entrepreneurs. As you may know, 500 Startups isn’t only an accelerator; it’s also a fund, investing in companies that aren’t participating in the program. According to Bedy, 500 Startups plans to keep on investing in four to five Latin American companies each quarter – essentially from Brazil, Argentina, Mexico and Chile, but maybe also from Colombia and Peru. Having someone on the ground obviously makes a huge difference – for instance, neither ContaAzul nor Rota dos Concursos are from Sao Paulo, but from emerging local tech scenes. Over the last months, 500 Startups and Brazil Innovators already invested in three companies that primarily target the Brazilian market: the language learning startup Colingo, the real estate website VivaReal and the e-learning service Descomplica. These investments are quite complementary. While attending a Startup Weekend in Brazil gave Colingo’s founder Lee Jacobs a chance to connect with the local ecosystem, he was one of those who helped ContaAzul and Rota dos Concursos polish their pitches, and who organized important meetings in Silicon Valley for Descomplica’s CEO Marco Fisbhen. This connection with the US startup community is one of the key reasons why Fisbhen wanted to work 500 Startups and Bedy, her co-organizer for Rio Startup Weekend. At that time, Descomplica had already received angel money from the local fund Gavea Angels and didn’t need acceleration (see our recent story mentioning the company’s partnership with Vivo). Yet, Fisbhen was keen to make way for 500 Startups and structured a small round in which Gavea Angels and himself invested alongside 500 Startups to avoid dilution. 500 Startups’ and Brazil Innovators’ ambitions in Brazil go beyond finding lucrative deals. Both also hope to make an impact on the country and solve real problems – hence the large representation of education-related companies in their portfolio. There’s more coming in 2012, as Brazil Innovators is planning to increasingly focus on education, and launch several initiatives in this sector. Stay tuned!